My husband, Ross, sister-in-law, Beryl and I were travelling to Brisbane from Newcastle for our daughter’s wedding in September 2009. We decided to break the journey and stay at Coffs Harbour Terraces. Parking is underneath the units and we carted most of our necessary items up to the unit. I discovered that I was missing something and went back down to retrieve it. I came down the stairs and stepped into the car park but between me and the car was a large diamond python and I backed off quickly! Another visitor hit the concrete floor with his paper and the snake turned left and went between the cars and (I hoped) out into the garden. Carefully I retrieved the item from the boot, but when getting into the front of the car I jumped in instead of reaching in… retrieved what I wanted and quickly made my way back up the steps. Of course, you can guess the reaction to my news about a 2 metre diamond python…..just like every big fish story! We left Coffs the next morning, stopped in Grafton for fuel and to clean the windscreen and went onto Casino where we spent and enjoyable hour and a half visiting relatives before resuming the journey up through Kyogle. 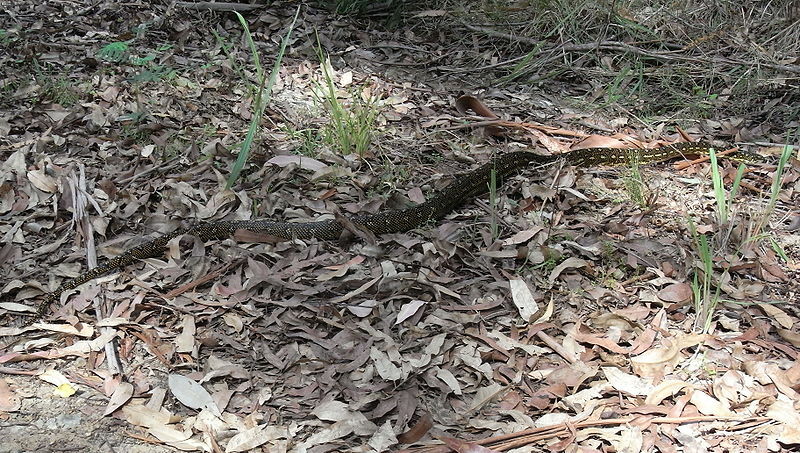 We had just passed through Wiangaree, heading uphill through a cutting when Ross said “I know where your snake is!”. I looked up to see the head of the snake coming down onto the bonnet of the car. We were unable to stop and had to continue over the hill and out of the cutting before pulling over. “You stay in the car and I’ll try to find a stick to get the snake off”. Beryl and I looked at each other – there was no way known to man that we were getting out of that car! Luckily our friend had had enough of cars and happily descended – last seen heading for the wide open space of the adjacent paddock. Husband and sister-in-law agreed that I had not exaggerated the size of the python! This entry was posted in (NSW) Coffs Harbour and tagged australia, Coffs Harbour, holiday, Python, road trip, Snake, Surprise. Bookmark the permalink.